The battle to dominate the home broadband market continues unabated, with the main industry players going to ever increasing lengths to ensure that they win the hearts and minds of consumers. This week I will assess three of the main protagonists in the sector: EE, Virgin Media, and BT. The market is changing rapidly due to technological advances, and each company is keen to say they are the fastest and provide the best value. It is the advertising market in which the companies invest so much. The three providers all have had recent high profile campaigns, often utilising a prominent celebrity to aid their cause and memorability. Kevin Bacon atop a rollercoaster in Blackpool for EE and David Tennant in a clapped-out Reliant Robin are examples of this. YouGov BrandIndex data can suggest which of the three has had the most effective campaign over the course of time. YouGov’s Ad Awareness metric indicates whether a person has seen an advert, either in print or broadcasts, within last two weeks. We can see that BT have the highest average score since April (24.1). Its strategy of using the same group of three students in a series of adverts to create a storyline is therefore hitting home with consumers. 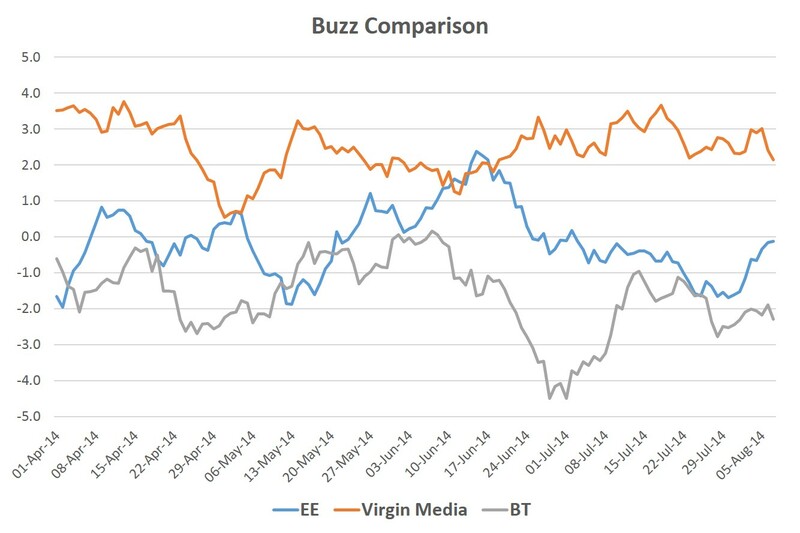 Over the same period of time, Virgin Media achieved an average of (21.0), at their highest peak in late June, they overtook BT, before the roles were reversed once more. At EE, we find a much lower rating. Although they saw a rise from late May, peaking in mid-June, their rating falls below their rivals, with an average of 14.0. Despite the success of their respective ad campaigns, it is clear that the brands can all suffer from negative press. YouGov’s Buzz Score metric indicates whether a respondent has heard anything negative or positive about a brand in the past two weeks. Comparing the same period as before, we see that the biggest drop-off was suffered by BT, from a very moderate high point of +0.2, to a low of -4.5. 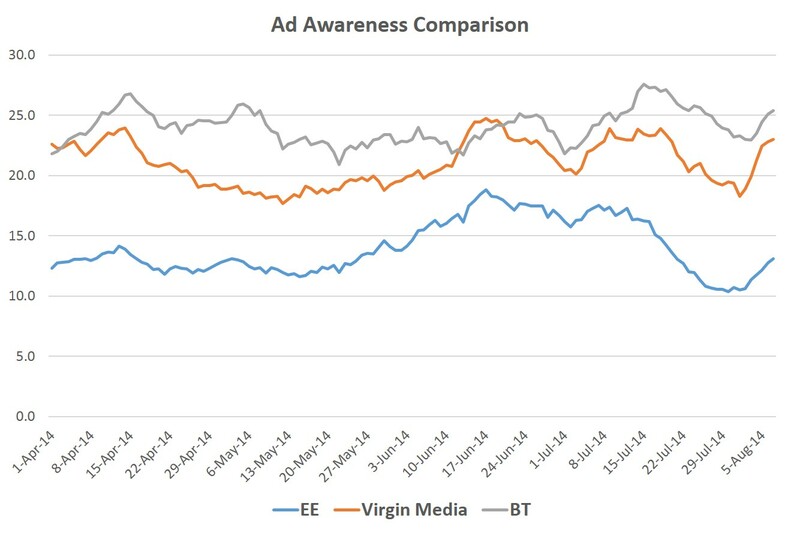 Virgin Media were the most solid over this period of time, averaging 2.5, while EE experienced a more varied period with a score of -0.1. Does this suggest therefore, that high profile ad campaigns are used to lessen the blow that negative coverage can often afflict upon a brand’s reputation? The coming months will no doubt see more high profile names attributed to each provider, in an attempt to steal a march in the ongoing broadband battle.